No cloud server or messaging system is completely secure: Just ask Hillary Clinton. Even though these systems are protected with layers of security, these layers can be hacked. Brute force attacks can crack passwords. MITM attacks using tools like sslstrip can turn secure sessions into insecure HTTP sessions. And outright manipulation of human confidence can be used to access virtually anything. This is why homomorphic encryption is on the brink of becoming popular in cloud computing, especially when only 25% of people trust cloud providers with their data. With homomorphic encryption, a cloud server can’t see the original content of a file. Instead of the original content being stored, a scrambled version of it is stored. And using homomorphic encryption, everything from plaintext to audio snippets can be stored, searched for, and located on the cloud server without the cloud server company seeing it (explained visually below). For instance, if you are a doctor who has dictated sensitive patient data (as hundreds of thousands of medical professionals do every day), you could send the recording to a homomorphic speech service, then search the audio file for specific keywords. Without understanding the content of the recording, the service could locate parts of the recording with those keywords and send them back to you. Currently, most practices send audio reports to medical transcriptionists, which is hardly secure, especially if the transcription service is outsourced and not kept in-house. At the end of the day, computers are less emotional and, therefore, more reliable with information than humans. At Intelligent Voice we take emails, phone calls and other communication and put them through a powerful, AI-driven analytics engine. This helps companies see what kind of conversations their team is having with customers, among other things. The results from this, including transcripts of video files and phone calls, can now be stored securely using homomorphic encryption on cloud servers. We can search encrypted audio transcripts without ever decrypting them. The cloud server never sees them in plaintext form and privacy is assured. Below we’ll go over how this works with an audio file. However, the approach is the same for files that are already in plaintext. We reduce an audio or text file into symbols (which could be phonetically based). These symbols are the “content” that’s indexed on our cloud servers. 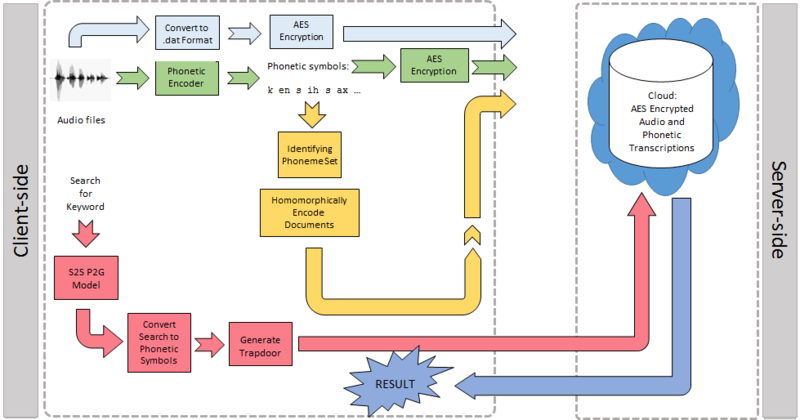 The encrypted audio and symbols are uploaded to the cloud and added to an encrypted index. When a search for a file is initiated, the search term is encrypted using our algorithms to find matching symbols. Relevant files and file portions are returned. This symbol approach is important (and patent pending) because it reduces “search space.” Technologists have found that if you search for words using this approach, it’s painfully slow because of the processing power required. You might be trying to find over a million possible combinations. However, if we take a word or phrase and reduce it to symbols — homomorphic HH AO MX AH MX AO RX FX IH KX, for instance — there are only dozens of available symbols. So we index these instead, across voice or text, and the search space is reduced from millions to dozens of units. Instead of looking for collections of matching words, we’re looking for matching streams. The use of voiceprint recognition software is becoming popular among companies that manage large customer service teams and employ speech-to-text and analytics engines like our own. Using voiceprints for security verification is easier for customers and also more secure. Take a banking institution for instance. While the customer service representative is asking you questions about your social security number and where you live, voice print recognition software could be working in the background for enhanced security. It would identify characteristics of your voice like pronunciation, emphasis, accent, and talking speed. Currently, it’s harder for someone to steal someone’s unique voiceprint than it is to steal information like social security and account numbers. But it’s not impossible. A hacker could easily hack a third-party cloud server that has your voiceprint and use voice mimicking software to hack your financial accounts. Even though homomorphic encryption was discovered decades ago, there’s only recently been enough computer processing power to make homomorphic storage and search practical. Before, it would take hours or days to do what now takes seconds. This is good news for cloud service providers, because even though cloud servers can be hacked, it won’t matter as much if they and their customers are using homomorphic encryption to increase the overall security and privacy of their data: If the cloud has never had a “plain” version of the original data, the hacked data remains encrypted and inaccessible.